Born: 1 September, 1912, in Barry, Glamorgan. Died: 21 April, 2005, in Pencarreg, Carmarthenshire, aged 92. GWYNFOR Evans won a sensational victory in July 1996 to become Plaid Cymru’s first MP in a by-election in Carmarthenshire. His win generated publicity on a UK-wide scale that paved the way for Winnie Ewing to take Hamilton for the Scottish Nationalist Party the following year. Both suffered hatred and brutish opposition from their native Labour MPs. One of the few to extend the hand of friendship was Emrys Hughes, MP for South Ayrshire, and a fellow Welshman. He advised Evans to avoid Welsh Labour members; Hughes backed his courtesy by standing the following year along with Ross-shire Liberal MP Alasdair Mackenzie as one of Winnie Ewing’s sponsors on her entry into the House of Commons. Evans was a gentle gentleman, a charismatic pacifist who was the unlikeliest of people to enter the thrust-and-parry of politics. A convincing speaker, he led his party for 36 years from 1945. By profession a solicitor and by nature a thinker, he was the author of scores of pamphlets and 16 books, including one written in collaboration with Scots literary giant Hugh MacDiarmid. A global thinker and steely ambassador for Welsh nationhood, the deeply-Christian Evans possessed moral courage in abundance. At the outbreak of the Second World War, he was discharged from military service as a conscientious objector. Not wishing, in wartime, to be seen profiting from his growing legal practice in Cardiff, he moved to Carmarthen to set up as a market gardener growing tomatoes. It was a move he never regretted, and he remained in Welsh-speaking west Wales for the rest of his life. On good days he wrote in the conservatory of his home, looking out to a garden plinth on which sat a metal dragon. "Regard the dragon," he would say, "renowned for ferociously guarding its young." He guarded Wales with equal ferocity, for all his pacifism and gentleness. 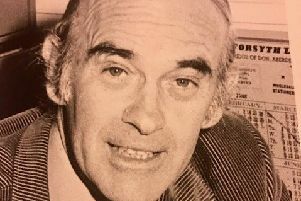 A member of the court of the University of Wales for a quarter-of-a-century from 1946, he had a force of personality that drove forward Welsh as the natural language of Wales. For someone whose command of the language included oratory and authorship, Evans was not born a Welsh speaker. His parents were respectably Anglophone, so Evans was sent to an English-speaking school, Barry Grammar. It was his sixth-form introduction to Welsh literature that started his interest in the language and the cause. At 18, he began to learn Welsh and went to the University of Wales at Aberystwyth, continuing at St John’s College, Oxford. In 1937, he joined Plaid Cymru. His views on Welsh had the absolute support of his wife and seven children, and he succeeded in swinging Plaid Cymru to "passionate pacifism" in support of the language and culture of the nation he so loved. One of his daughters, Meirin, served a prison sentence for defacing transmission equipment during the campaign for a Welsh television channel in the early 1970s, and while he disagreed with her tactics, he was immensely proud of her courage. In 1980, he vowed to fast unto death unless the government introduced a Welsh-language television channel. The love with which he was regarded by Welsh people, including non-nationalists, forced the then Prime Minister, Margaret Thatcher, into a U-turn, resulting in a giant graffito, "Gwynfor 1, Thatcher 0", appearing on the Thames embankment opposite Westminster. Two years later, S4C came into existence, and is now regarded as an integral component of broadcasting in the principality, and something of a memorial to Evans. Evans lost his seat by just three votes in 1970, regaining it later that year. Ever the venerated figure, he was made honorary president of Plaid Cymru in 1982. He married Rhiannon Prys Thomas in 1940, and he is survived by their four sons and three daughters.